A team of researchers, engineers and students is now at sea to check the equipment in a massive seafloor laboratory, where underwater stations off the Pacific Northwest coast collect data and provide a real-time, virtual eye on the deep sea for people on shore. 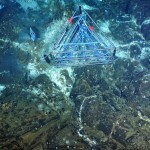 Sensors on the ocean’s floor installed by UW researchers show that late on April 23, a seismic event took place on the 3,000-foot underwater volcano off Oregon’s coast. 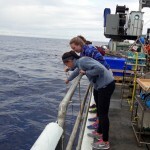 In a seven-week cruise this past summer, oceanographers and students laid 14 miles of extension cable and installed about a dozen instruments for a historic deep-sea observatory. 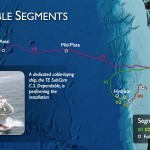 A UW research vessel leaves July 2 for six weeks at sea, during which oceanographers will install miles of cable for a new type of deep-sea observatory. 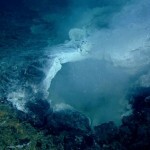 A new half-hour documentary about a UW research expedition to Axial Seamount, an underwater volcano off the Washington coast, airs tonight at 9:30 p.m. on UWTV. 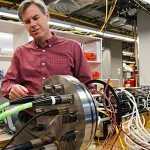 Engineers at the UW’s Applied Physics Laboratory are under pressure to build and test parts for installation this summer in the world’s largest deep-ocean observatory off the Washington and Oregon coasts. 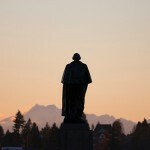 The American Geophysical Union has presented its top prize for engaging the public in science to UW’s John Delaney. 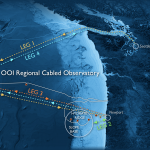 Submarine cables for the nations first regional cabled ocean observatory, a project led by the University of Washington, made landfall last week on the Oregon coast. 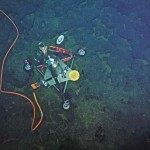 Journey 300 miles off the Washington-Oregon coast and dive nearly a mile deep into the ocean as scientists and 20 students use underwater robots to explore, map and sample methane ice deposits, an underwater volcano and seafloor hot springs spewing water up to 570 degrees F.
Like a deep-sea bloodhound, Sentry — the newest in an elite group of unmanned submersibles able to operate on their own in demanding and rugged environments — has helped scientists pinpoint optimal locations for two observation sites of a pioneering seafloor laboratory being planned off Washington and Oregon. 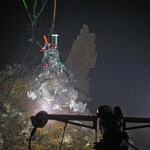 John Delaney, the UW oceanographer who is leading the effort to build a cabled underwater observatory off the Washington and Oregon coasts, will speak on Tuesday, Oct.
Peter Barletto, who has more than three decades of experience with submarine cable systems and networks, started work at the University of Washington Monday, joining the project team tasked with developing detailed engineering specifications for a cabled underwater research facility to be built off the coast of Washington and Oregon. 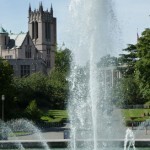 With $150 million in President Bush’s proposed budget to install a cabled seafloor observatory off Washington and Oregon, a planning session is being convened June 5 for UW faculty and departments to learn how they might take advantage of this new facility for earth and ocean research and education. 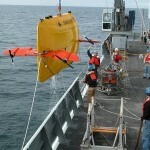 John Delaney, University of Washington professor of oceanography, has been named the first holder of the Jerome M.
With clever engineering and being in the right spot, under the right satellite, UW oceanographers working with Computing & Communications and the ResearchChannel became the first team in the world to broadcast high-definition video from the seafloor to selected sites around the world Sept.